On Aug. 3, after China’s first case of African swine fever was announced, in the Shenbeixin district of Shenyang, pig farmer Yang Ming (not his real name) received a call from his daughter. She was concerned about Yang’s farm, 200 kilometers (124 miles) from the district of Liaoning province’s capital. But still, Yang and his wife began to grow anxious. They looked up the disease on the internet, and disinfected their pigpens every day. “We didn’t visit any other pig-farming families. We didn’t even let any visitors in,” Yang said. Two months later, in mid-October, some of Yang’s pigs at his farm, in the coastal Liaoning city of Panjin, developed fevers. He bought a large box of thermometers, and injected his pigs with medicine. The symptoms he had read about online started appearing in his own animals — loss of appetite, vomiting, bloody feces, and purple patches on their skin. Then they started to die in batches, Yang told Caixin. The couple reported the situation to authorities. Elsewhere in Yang’s district of Dawa, other farmers were seeing the same symptoms in their own livestock. One farmer in previously peaceful Wangjiacun village threw out a few dead pigs on Oct. 13. Within three days, there were five confirmed outbreaks of African swine fever across the district. The disease has since spread rapidly through the country and has now affected 20 provinces and provincial-level regions, including the country’s southwestern pork production heartland. Around 600,000 pigs have been culled in the country — the world’s largest pork producer and consumer — since August, authorities said on Friday. According to the many nearly identical announcements of new outbreaks issued by China’s Ministry of Agriculture and Rural Affairs, authorities responded to each reported case with a standard list of measures — closing off and disinfecting affected areas, culling surviving animals, and restricting the movement of pigs and pork products. But the reality of fighting the disease is far more complicated, Caixin learned on a recent visit to Dawa. Local experts involved in investigating the district’s outbreaks declined to be interviewed, but one grassroots disease prevention officer said that while he had felt pressure to manage the disease and received many calls from higher-ups, he was unsure how to do so. “I conducted the twice-daily inspections in a timely manner. But even experts aren’t sure how the disease appeared, so how can I prevent it?” he asked. The grassroots officer said professional, trained veterinarians met with farmers only in the spring and autumn of each year, when the veterinarians distributed vaccines. Grassroots disease-prevention officers are mostly “barefoot doctors,” another grassroots officer told Caixin, using the Chinese term for people in rural areas equipped with basic medical skills but not a high degree of professional training. Locals have focused on disinfecting affected areas. “Our home is disinfected every day, with soda, lime, and disinfectant fluid, and the village brigade comes twice a day,” farmer Yang said. 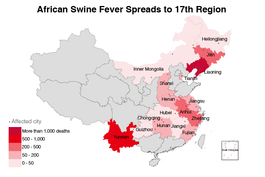 African swine fever can be deadly for pigs, but is not known to affect humans. It’s spread primarily through contact with infected animals and contaminated pork products, according to the European Food Safety Authority. 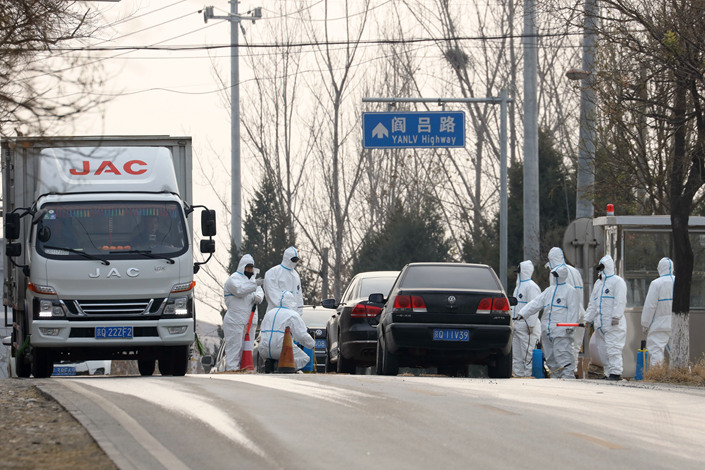 Alarmed by African swine fever’s seemingly unstoppable spread, China’s Agriculture, Transport and Public Security ministries issued a rare joint statement in mid-November blaming the crisis on unhygienic transportation of pigs and “lawless elements” ignoring transportation restrictions. One possible group of “lawless elements” could have been farmers who continued to sell sick pigs without reporting African swine fever cases to the authorities, sources told Caixin. Pigs on farms with reported cases face mass culling, and outbreaks often result in the farm’s closure. 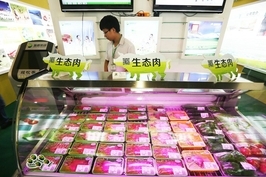 Compensation of up to 1,200 yuan ($173) per pig culled is offered to farmers. But still, “culling means every last pig, from the great-grandparent generation, the grandparent generation, the parent generation and the current sellable generation must be exterminated,” one epizootic expert told Caixin. “I don’t want subsidies,” a farmer in Mijiawopu village, Liaoning’s Fuxin city, told Caixin. “It takes two to three years to breed and raise a pig.” If he were to cull his animals, “the loss would be too great,” he said. Ticks have also been blamed as a possible transmission route. But Zhang Fengtian, the deputy dean of the School of Agricultural Economics and Rural Development at Beijing’s Renmin University, said humans were more likely the carriers of the disease. “The virus can live on people’s clothes for half a month. If they go to an affected pig farm, the possibility of pig infection exists,” Zhang told Caixin. Wan Sicheng contributed to this report.